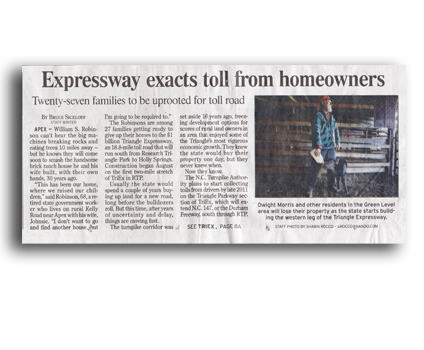 Triangle Expressway Extracts Toll From Homeowners. William S. Robinson can’t hear the big machines breaking rocks and eating trees 10 miles away – but he knows they will come soon to smash the handsome brick ranch house he and his wife built, with their own hands, 30 years ago. The Robinsons are among 27 families getting ready to give up their homes to the $1 billion Triangle Expressway, an 18.8-mile toll road that will run south from Research Triangle Park to Holly Springs. Construction began in August on the first two-mile stretch of TriEx in RTP. Usually the state would spend a couple of years buying up land for a new road, long before the bulldozers roll. But this time, after years of uncertainty and delay, things are moving fast. The turnpike corridor was set aside 16 years ago, freezing development options for scores of rural land owners in an area that enjoyed some of the Triangle’s most vigorous economic growth. They knew the state would buy their property one day, but they never knew when. The N.C. Turnpike Authority plans to start collecting tolls from drivers by late 2011 on the Triangle Parkway section of TriEx, which will extend N.C. 147, or the Durham Freeway, south through RTP. In late 2012, cars will be rolling all the way south to Holly Springs on the main part of TriEx, an Outer Loop extension called the Western Wake Freeway. But until July, there was no money available for buying up the right of way – and, for that matter, no guarantee that TriEx would even be built. Then the Turnpike Authority secured a federal loan and sold bonds to pay for the whole thing, and the starting bell was sounded. Most of the Triangle Parkway land was already available, a gift of the Research Triangle Foundation. So the Turnpike Authority started work in RTP and sent its appraisers and purchasing agents south ahead of the construction crews. This fall and winter they’re making offers to the owners of more than 200 properties – mostly vacant land – in the path of TriEx. The Turnpike Authority set aside $228 million, roughly a quarter of the project cost, to buy 525 acres and cover other right-of-way expenses. If landowners don’t like the state’s offer, the fast construction schedule allows little time for haggling. Turnpike officials say they will begin exercising the state’s power of eminent domain in the coming weeks, when they file the first batch of condemnation papers and take title to 11 tracts they need. The former owners will be paid what the state deems fair-market value, with the final purchase price to be settled in court. The turnpike will slice through piney woods and pastures that have been insulated from western Wake County’s brisk development since 1993. That’s when the state took steps to preserve a 300-foot-wide swath of land for what was planned as a toll-free leg of the Outer Loop. Construction was pushed back twice. The project was reborn in 2005 as a toll road. Faded barns and dirt driveways mark the TriEx corridor; in some places it is unmistakable in satellite photos – a green band pressed on both sides by rooftops and parking lots. “Folks that own property certainly were aware there was a time coming when this would happen,” said Steven D. DeWitt, chief engineer for the Turnpike Authority. John Kane, 61, is retired from an auto service business. Lorraine Kane is 59, with serious health problems that cut short her career as a schoolteacher. Soon the Turnpike Authority will condemn their land and make them millionaires. The state’s latest offer is a little over $4 million for their house and 22 acres, Autry said. The final price will depend partly on how much economic damage is caused to their 40 acres of farmland. When the state takes their homes, residents will have 90days to move out. Judy and Roy Howell will lose about 10acres on Green Level Road near Cary, along with the house they’ve shared for 36years. They’re still negotiating with the Turnpike Authority, but they have already started looking for a new home nearby. William Robinson shares a driveway on Kelly Road with his neighbor, Royal T. Jones Jr. Both houses, built in 1979, are on the TriEx hit list. He figures he’ll be in his house through one more winter. He hasn’t looked for a new place to live, because he doesn’t know how much money he’ll have to spend. “That depends on how much they give me for this one,” Robinson said.